Leave Nairobi to Kit - Mikaye via Kisumu arriving in the afternoon. Explore the legendary stone. Overnight at Kit -Mikaye. After breakfast leave for Kaloka beach as you walk down the lake you can chat with local people on the way. Arrive at the beach at around 9.00 am and then continue to the Island by boat. 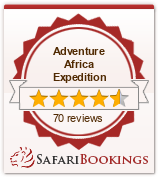 Explore in search of large crocodiles, impalas and swamp antelopes, birds etc. Ndere (meeting place) according to Luo legendary is the place Mikaye the mother of the Luo tribe rested after her long journey down the Nile valley. In the evening go fishing with the local fishermen. Overnight at Kaloka beach. After breakfast leave for Kisumu by lake or by road to catch a boat to Nairobi, arriving in the evening.